The end is nigh. After an action packed 3 weeks, we arrive in Madrid. 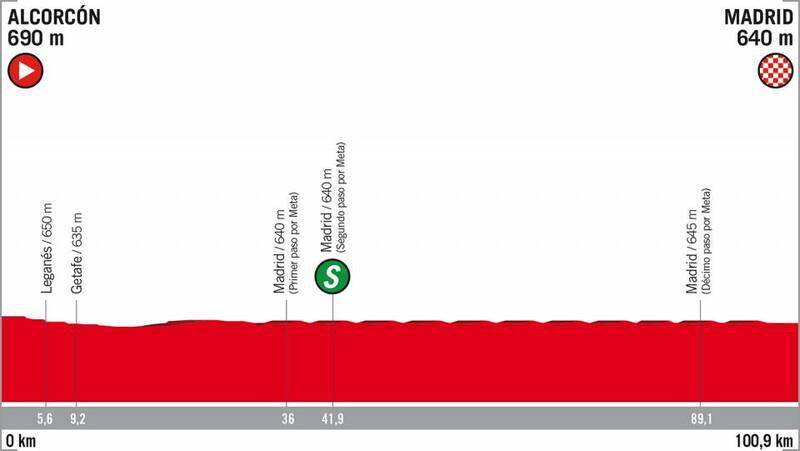 It’s the standard stage in Madrid, with the big u-turn in the finale. This will be a big sprint, we’ve only had 2 in the whole race. No need to discuss tactics, it’s all about the final 3km. Elia Viviani – the Italian has two stage wins and is the quickest rider in the race. Being led out by Devenyns, Mørkøv and Sabatini means he’ll be put into a brilliant position, but that doesn’t guarantee success. Viviani was beaten in the final stage of the Giro, he’ll be super motivated to take this one. Peter Sagan – we’re not used to seeing the world champion suffer through a race. Without a stage win, he’ll be hopefully of taking the final stage. Sagan’s lead out isn’t great, but Pöstlberger did a great job the other day, it was a shame that they left it too late. In this finish, Sagan will start his sprint behind Viviani, making it hard to take the win. Giacomo Nizzolo – fast, but not fast enough. Danny van Poppel – the Dutch sprinter does have the speed required to win, but he’s been poorly positioned in the last couple of sprints. As I have mentioned before, he produces the same power numbers as Groenewegen, but doesn’t convert this into wins. Thanks again to everyone for reading over the last 3 weeks, the Vuelta really is an amazing race. Vamos! Mole come on man, Sagan dropped the entire peloton the last sprint stage. I know that it isn’t fun to back the champ but viviani is just not the best sprinter in the bunch. Thanks for your excellent daily preview and coverage. It made all the difference to fully enjoy the race and what a race we had! The TdF pales in comparison.